Abstract: Chronic leg ulcers are a significant health care concern. Although deep wounds are usually treated by flap transfers, the operation is invasive and associates with serious complications. 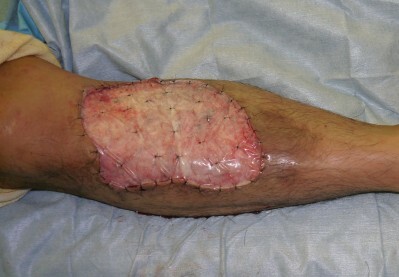 Skin grafts may be a less invasive means of covering wounds. However, skin grafts cannot survive on deep defects unless high-quality granulation tissue can first be generated in the defects. Technologies that generate high-quality granulation tissue are needed. One possibility is to use wound care matrices, which are bioengineered skin and soft tissue substitutes. Because they all support the healing process by providing a premade extracellular matrix material, these matrices can be termed “extracellular matrix replacement therapies”. The matrix promotes wound healing by acting as a scaffold for regeneration, attracting host cytokines to the wound, stimulating wound epithelialization and angiogenesis, and providing the wound bed with bioactive components. This therapy has lasting benefits as it not only helps large skin defects to be closed with thin skin grafts or patch grafts but also restores cosmetic appearance and proper function. In particular, since it acts as a layer that slides over the subcutaneous fascia, it provides skin elasticity, tear resistance, and texture. Several therapies and products employing wound care matrices for wound management have been developed recently. Some of these can be applied in combination with negative pressure wound therapy or beneficial materials that promote wound healing and can be incorporated into the matrix. To date, the clinical studies on these approaches suggest that wound care matrices promote spontaneous wound healing or can be used to facilitate skin grafting, thereby avoiding the need to use invasive surgical tissue transfer strategies.